Your Web AddiCT has been fortunate enough to spend time with the CEO & Innovation Manger of MXit to discuss where things could be headed for Africa’s largest social network. I can’t really talk about what was discussed until it is released to the public but one of the major themes of our conversations were games, MXit Games. Since the launch of the MXit API SDK some interesting MXit games have been launched. The proof-of-concept game built by MXit was tiXi and also Chess. Since then a few other MXit games have become available. You can see a showcase of games and app build using the MXit SDK here. A new MXit game that has been released by Bazooka Games recently is Battle Trivia. Battle Trivia allows players to play in multiplayer trivia rooms, competing for points by answering trivia questions. All questions are generated by (and is licensed to) Bazooka Games and are categorised according to type, genre and difficulty. The points awarded to a player depends on the amount of players competing, amount of players correctly answering a particular question and question difficulty. Bonus points or multipliers may be awarded for answer streaks. 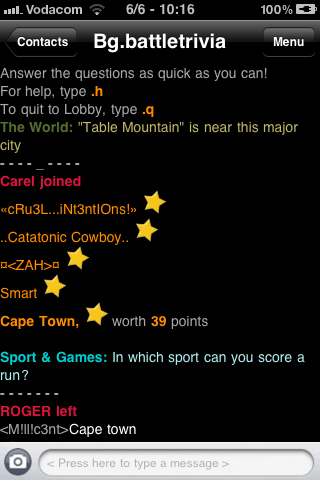 Another MXit game is Moonbase…. Moonbase is a game in which thousands of players from around the world compete against each other in a real-time contest of military, economic and political strategy. You start the game in charge of a brand new Moonbase which produces resources (Oxygen, Water, Iron and Helium) and has a few buildings that allow you to explore your neighbourhood and communicate with Moonbases nearby. Your main job as the Moonbase commander is to decide what to do with the resources that your Moonbase produces. You can use them to upgrade your resource mines, which increases their rate of production, or you can use the resources to construct new buildings that allow your Moonbase to do new things. The Trade Pod allows you to trade with other players. Building a War Room allows you to construct an army to defend your base or attack others. A Comm Station is where you form an alliance and coordinate their actions, and the Research Lab is where you invest in new technologies that unlock more and more capabilities. Getting a grip on military tactics is crucial to your survival on the Moon. Moonbuggies are the cheapest unit and are slow and good at defending, but Gunships are better for attacking because they have better offensive weaponry, faster speed and more storage space for plundered resources. Laser cannons are huge, lumbering siege weapons that are only useful for one thing: pounding your enemy’s Moonbase into the Moondust! While commanding your own units and managing your base are both crucial elements in the game, the most important part is managing your alliance. The only way to win the game is to be a part of the one alliance strong enough to defeat the others, so the real test of the game is to see which group of people can work together the best to outsmart all the rest. If you know of any MXit Games or have developed a game specifically for MXit please get in touch or post a comment below.